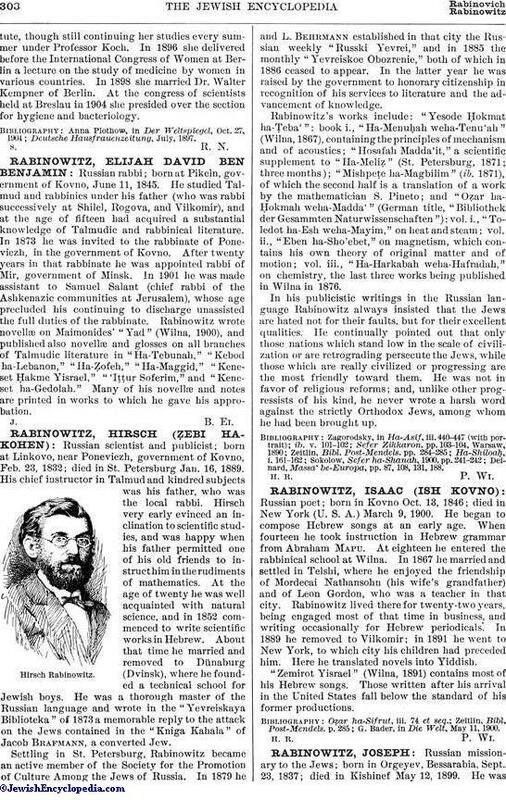 Russian rabbi; born at Pikeln, government of Kovno, June 11, 1845. He studied Talmud and rabbinics under his father (who was rabbi successively at Shilel, Rogova, and Vilkomir), and at the age of fifteen had acquired a substantial knowledge of Talmudic and rabbinical literature. In 1873 he was invited to the rabbinate of Poneviezh, in the government of Kovno. After twenty years in that rabbinate he was appointed rabbi of Mir, government of Minsk. In 1901 he was made assistant to Samuel Salant (chief rabbi of the Ashkenazic communities at Jerusalem), whose age precluded his continuing to discharge unassisted the full duties of the rabbinate. Rabinowitz wrote novellæ on Maimonides' "Yad" (Wilna, 1900), and published also novellæ and glosses on all branches of Talmudic literature in "Ha-Tebunah," "Kebod ha-Lebanon," "Ha-Ẓofeh," "Ha-Maggid," "Keneset Ḥakme Yisrael," "'Iṭṭur Soferim," and "Keneset ha-Gedolah." Many of his novellæ and notes are printed in works to which he gave his approbation.